HARLEM — After a series of small, black-owned businesses closed in Harlem recently, many asked where was the help to keep these shops open as national retailers continue to flood the neighborhood. 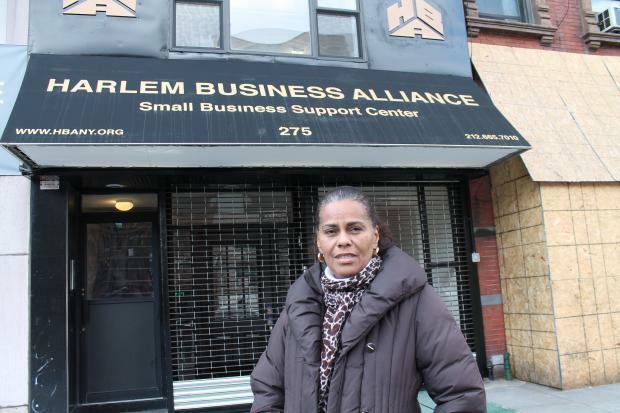 Now, the Harlem Business Alliance will use a $700,000, three-year grant to open a Small Business Support Center. The grant will assist them with crucial back-office operations, including marketing, bid preparation, payroll, budgeting and strategic planning, said Regina Smith, the group's executive director. "It is distressing to us that we are losing so many black-owned businesses in the community," Smith said. "We need to be able to do more and that's why we are pulling together this center." In the last several months, a number of small black-owned businesses have shuttered, including Sherman's Barbecue, a 60-year-old rib joint that served the Beatles; Hue-Man Bookstore; bowling alley Harlem Lanes; Nectar Wine Bar; and Society Coffee. Mobay Uptown, a Caribbean soul food restaurant along 125th Street and wine shop Harlem Vintage have also closed. Bikram Yoga-East Harlem was trying to reopen and the Lenox Lounge was forced to move to a new location after rent at the iconic spot doubled. "Often times we hear about it at the last minute when we might have been able to cut through the bureaucracy and provide early assistance and support," Smith said. The backroom office functions often go ignored for many small businesses because of a lack of time or experience. Getting certified as a minority or women-owned business can help bring in valuable contracts. Proper bookkeeping can help businesses forecast problems, and knowing how to market your business can also bring in new clients or customers. "We have to put entrepreneurs in touch with new tools and they really need a hands-on approach to gain these lessons," Smith added. Ivy Julease Newman, president and founder of the Viney Group, a boutique marketing and consulting firm, said the Harlem Business Alliance has helped her with her bookkeeping functions. "I am so much more organized. Better bookkeeping has allowed me to make projections and it keeps me on a schedule," Newman said. The owners of Bikram Yoga-East Harlem said they fell behind after finding out Con Edison had incorrectly estimated their bill. Harlem Lanes suffered through slow periods. "You can get behind because you are so concerned with your clients, but this has helped me project business growth," Newman said. "I can figure out where and how to invest money. It's very important to my bottom line." The new center will also make the Harlem Business Alliance more visible. Using a grant from the Community Economic Development Program from the U.S. Department of Health and Human Services, the alliance will expand into the ground level space at their building at 275 Lenox Ave. Through a partnership with IncubateNYC, the space will be fully furnished and equipped with Wi-Fi and computers for clients' use. Along with this support, Smith said there are plans in the works for cheaper, shared office space and business incubators that would allow Harlem businesses to grow even as national chains, such as Whole Foods and Red Lobster, continue to find Harlem attractive. "We need to generate and support as many entrepreneurs as we can because they are vital to our community," Smith said. Newman said she plans to take advantage of the new services and become certified as a minority and women owned business. "I believe it is why I have a healthy business," Newman said of her willingness to seek help. "I don't foresee closing any time soon. I only see growth."